Supreme Court Justices Sonia Sotomayor and Neil M. Gorsuch. Photos courtesy of the U.S. Supreme Court. 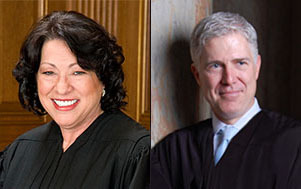 Supreme Court Justice Sonia Sotomayor has once again joined with Justice Neil M. Gorsuch to dissent from the high court’s refusal to hear a case. In November, Sotomayor joined Gorsuch’s dissent arguing that the Supreme Court should have accepted a drunken driving case. The drunken driving suspect had argued she was denied the right to confront witnesses guaranteed by the Sixth Amendment when an analyst who performed a blood-alcohol test did not testify at trial. A different Sixth Amendment right—the right to a jury trial—was before the court in the new case. Gorsuch argued that the case is important because of the prevalence of restitution orders. Failure to pay restitution can have a “profound” impact, including suspension of the right to vote, continued court supervision and even reincarceration, he said. Sotomayor also dissented from a cert denial in a separate case on Monday, Cleveland v. Sellers. She argued that the Supreme Court should have accepted the case of Georgia death-row inmate Donnie Cleveland Lance. Justices Ruth Bader Ginsburg and Elena Kagan joined Sotomayor’s dissent. The lawyer, a solo practitioner, was so convinced of Lance’s innocence that he never prepared for a sentencing phase of the trial, Sotomayor said.